"I can trace something that I've made to every one of my selections. 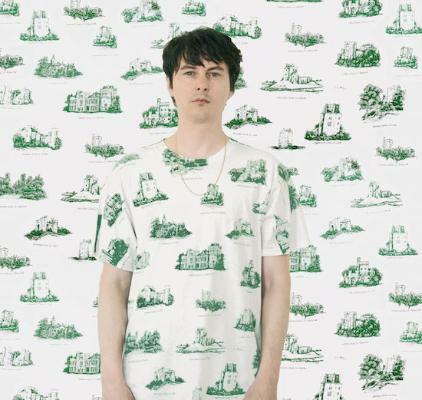 They're definitely all influences in some way," says Noah Lennox, aka Panda Bear, in a boozer in East London where we meet to discuss his Baker's Dozen. For any other artist, a glance at the eclectic list, which takes in everything from dub and obscure Kompakt techno to Justin Timberlake and Black Sabbath, and you might dismiss such a claim, but Lennox – both under his own steam and as part of Animal Collective – has an adventurous sonic spirit, and there are definitely elements of pop, R&B, psychedelia, world music, electronica, rock, dub, techno and house permeating all the music in his genre-defying back catalogue. "I picked and chose," he says, when asked about the music he was into growing up. "I never found myself aligning perfectly with one thing. I never fell in with a group of people where a specific type of music defined them. Y'know, you wear the patches with the band name on your backpack as an indicator of your self-image. I never had that. I never had one massive influence to go one way with music." This was mainly because his parents, while music fans, didn't play a lot of music at home during his childhood. His mother was into ballet ("That's the reason for her existence. She's obsessed with it") so there was some classical music played, but other than that it was "top 40 radio in my father's car." However, being into music was definitely encouraged in Lennox and his siblings: "Music was talked about in a way that was very respectful." According to Lennox, his new album (his fifth as Panda Bear), Panda Bear Meets The Grim Reaper, which we are also here to discuss, is "my hip-hop album". That's not to say he's picked up the mic and started dropping science, it's to do with his use of the sampled breakbeats that underpin the compositions. "Most of the drum breaks are hackneyed," he explains. "They've been used many, many times in various productions. At first I saw that as a disadvantage but then I thought, not only will this be a gateway for people who might not normally listen to music like this - a familiar element for them - but I also liked the challenge of taking something that was common and everywhere and trying to sculpt it into something that nobody else could have made. Something that had my personality." And it is not just Lennox's personality that is writ large on the album. Pete Kember, aka Sonic Boom (Spacemen 3/Spectrum) had a much greater influence on Meets The Grim Reaper, having previously mixed Tomboy. "Pete improved the music in many ways. I feel like his stamp is way more on this album, in ways that are more implicit. The impulse creatively for both of us is just to distil things to the essence - to reduce something to the stuff that needs to be there. In that way I think we complement each other really well because our target is exactly the same. But the way that we listen to the music is very different. Literally, like what we hear when we listen to a piece of music and the way we respond to it. He'll notice things, like frequencies or imbalances, that I don't. They don't occur in my brain like that. Whereas I'll have more of an instinctive response to something, on an emotional level. Or I'll search for the immediacy of something, which he doesn't. He's certainly capable of doing that, but he doesn't do that in the same way that I do. So because we're aiming for the same place, having our two approaches works." I took the album title literally and read all sorts of references to death into the songs - with titles like 'Tropic Of Cancer', which opens with a blast of 'The Last Post' and has a vocal refrain that goes, "You can't come back, you won't come back", it's an easy thing to do. But Lennox says that it's more of a nod to the titles of his beloved dub records (Scientist Meets The Space Invaders, that sort of thing) and a reference to the album being the end of a cycle for him rather than anything directly connected to mortality. "None of the songs deal with death in a literal sense. In 'Tropic Of Cancer' I more meant that in terms of identity - like when we experience something really intense it will force us into evaluating ourselves in a new way. And when that happens, a part of us dies. Our self-image goes away and it is, in a sense, like a death. The title is also a way of presenting something dark and intense that we don't seek to deal with, but packaged in way that's light and casual and kind of funny. It appears to me like a cartoon or a comic book. A lot of the songs did a similar thing - the subject matter is kind of heavy-handed and dark and intense, but to balance that out, the songs are light and casual and have elements that are familiar - certainly the drum breaks." That familiarity is also there in the melodies and the songs themselves, which feature many of the other Panda Bear motifs - multitracked Beach Boys harmonies, otherworldly electronic dissonance, heavy reverb and a kind of bubbling, underwater quality to the production that is unique to his music (though owes a considerable debt to dub). "I wanted to take a traditional pop song and remove the verses from it so that all you are left with is hooks and choruses," he explains. "I wanted to write little earworms that would grab people who might not listen to music that features more abrasive elements. It was a way of tricking people into listening to something they wouldn't normally be into. It's like a Trojan horse." Back on the subject of music, and specifically how he finds new music in the internet age, Lennox has an interesting theory - despite the technological advances, nothing much has changed. "The medium to interact with music has changed, but post-radio, for me, I still discover music in pretty much the same way as I always did. I still find most music from friends telling me about stuff. They suggest stuff on Twitter, or sometimes from other musicians making mixes and uploading them. No one's giving out mixtapes any more, but they're all over the internet. So yeah, the medium is different, but it's still about people that you like telling you what they think is really vital, and that's the way it's always been for me."